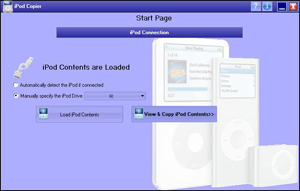 iPod Copier is very easy to use tool to Copy your iPod Device(Any Type), you can copy tracks from iPod to your local hard drive. With iPod Copier you can: 1- View all Audio/Video iPod Contents. 2- Play Audio/Video Tracks of the iPod. 3- View the properties of the Audio/Video tracks of the iPod. 4- Copy Audio/Video tracks from iPod to local hard drive. 5- Search in the tracks properties to easily find the desired track. 6- Support All iPod Types. Qweas is providing links to iPod Copier 1.0.0.3 as a courtesy, and makes no representations regarding iPod Copier or any other applications or any information related thereto. Any questions, complaints or claims regarding this application iPod Copier 1.0.0.3 must be directed to the appropriate software vendor. You may click the publisher link of iPod Copier on the top of this page to get more details about the vendor.